There was a close call with violent weather near our property yesterday afternoon, but we squeaked by with no obvious damage. We haven’t walked through all our woods yet, but the openly visible spaces look unharmed. The worst inconvenience we faced was flashing digital clocks that were the result of a brief power outage at the height of the storm. I was in Hudson at an annual eye appointment when the sky darkened and windblown rain pummeled the building. By the time I was ready to drive home, the sun was coming out. I had no idea a tornado had formed just a few miles northeast of our home. I heard mention on the radio of severe weather nearby during my drive. That didn’t surprise me, based on the ominous looking sky I was driving toward. Luckily, the threat was moving away from me the whole time. I want to go out and hug my trees. Despite my desire to get the already too long grass mowed yesterday, due to an all-afternoon soaking precipitation on Thursday that delayed getting started early, I ended the day without ever having turned the key on the lawn tractor. As so often happens, activities unfolded with total disregard for my feeble plans. 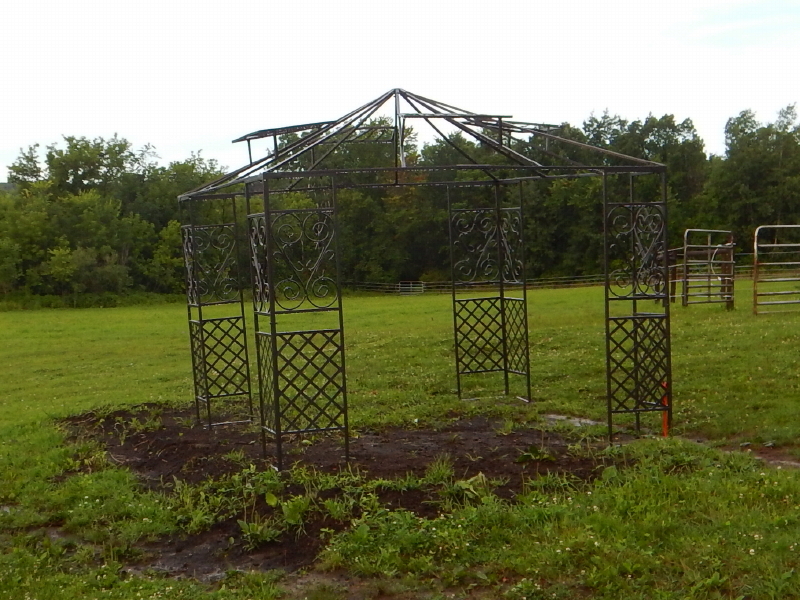 Knowing we had an appointment scheduled for George to trim the horse’s hooves at noon, I chose to dip into a project down at the barn, finally assembling the shade gazebo that we purchased over a year ago. I threaded nuts on bolts for hours on end throughout the intense afternoon heat. Cyndie provided valuable support, including going to the trouble of making a temporary fence to enclose the horses on some of the too-long grass outside the paddock, so they could do some “mowing” for me. At the end of the day, we decided to save the work of stretching the canvas over the top for this morning when we would have fresh energy. That turned out to be a really smart decision, especially since I have yet to drive the anchors into the ground. In the middle of the night, we were startled awake by an incredibly intense storm. We both fully expected to find the spindly frame tossed into a tangled mess, pressed up against the round pen rails nearby. Lightning flashed at a shocking rate, wind stressed our house, and the power went off for a couple of hours. The generator kicked in perfectly, but the sound of it tended to fuel the dramatic feeling of alarm over the significance of the storm raging outside. Alarms chirped occasionally within the house, at the sudden absence or intermittent return of AC power during the outage. There are only a few essential circuits that the generator maintains, so much of the rest of our electronic devices remain at the mercy of the power grid. Getting back to sleep was a challenge. I always think about how the horses are faring when the level of intensity of thunderstorms is so extreme. By the time we find them in the aftermath, they always seem so unperturbed. This morning they were happy as could be. I wondered aloud if Legacy knew that today was his birthday. The elder statesman of our herd turned 19 today. To our joint surprise, as we came around the woods and the new gazebo frame came into view, it looked exactly like the way we left it last night. It survived its first test with an excellent result. Now we need to walk the trails and see if all our trees held up nearly as well. Despite the recent trend of precipitation missing us as waves of disjointed showers and thunderstorms have been flowing over our region, yesterday evening we finally received rain, but in the form of a dramatic gully washer. It poured as if from a pitcher, and then stopped as quick as if the pitcher had returned to upright. 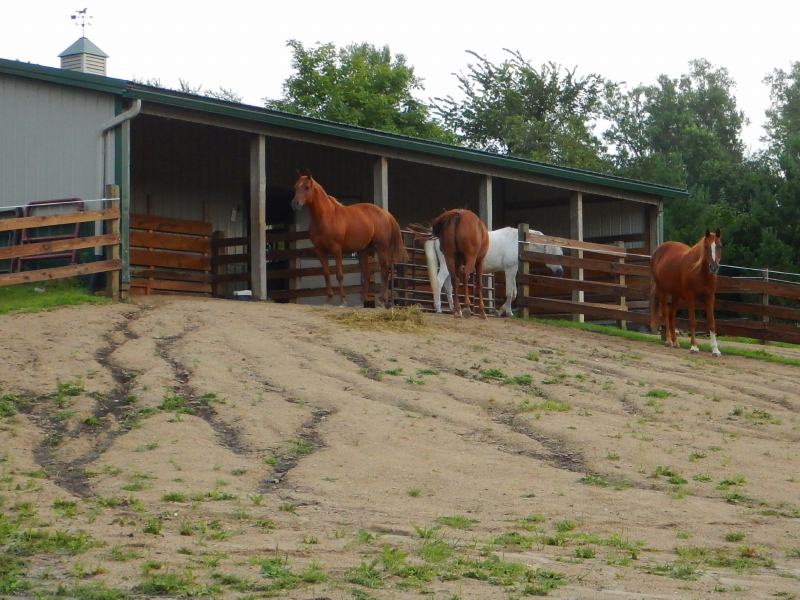 Just as I was beginning to consider a trip outside to tend to the horses, the downpour resumed in full gusto. The sound of such heavy bursts of rain is dramatic enough on its own, but we also had a few booms of thunder which served to amp up the excitement. On top of that, Delilah felt the need to run to and fro, barking her 2-cents worth toward the storm. My decision to remain calm and collected despite it all made no visible impact on her confidence over our relative safety in the moment. After the third or fourth wave of heavy rain, we received a sign that I could venture outside. The setting sun popped out from behind clouds, creating an irresistible invitation to go outside, even though some residual rain at our location was still dripping from the clouds overhead. I chose to override my better judgement and wandered around with Delilah tethered closely to me as the lightning and thunder on the backside of this storm continued overhead, preventing Delilah from reaching anything close to calm and secure during this particular walk. The air had the fresh smell of recent lightning strikes and the copious amount of water that fell in a surprisingly short amount of time was now rushing through our drainage swale. I felt a sense of appreciation for the much-needed moisture that was providing a life-giving treat to all our growing things. The giant double rainbow that was filling the sky to the east served as an exclamation point to the whole sensational event. 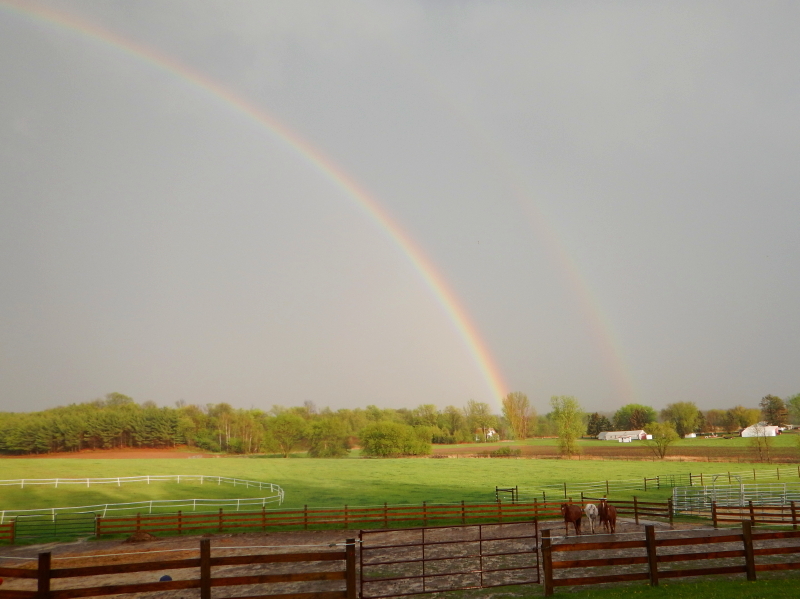 From where I stood, it shone down on the horses clustered close together in the paddock to ride out the storm. I took Delilah into the paddock with me to open a gate that allowed the horses into the back pasture for the night, then headed back toward the house to check the rain gauge. We had received 1.75 inches of rain in about 45-minutes time. I hope more of it soaked in than flowed away in the runoff. It just might have been a case where we got too much of a good thing. 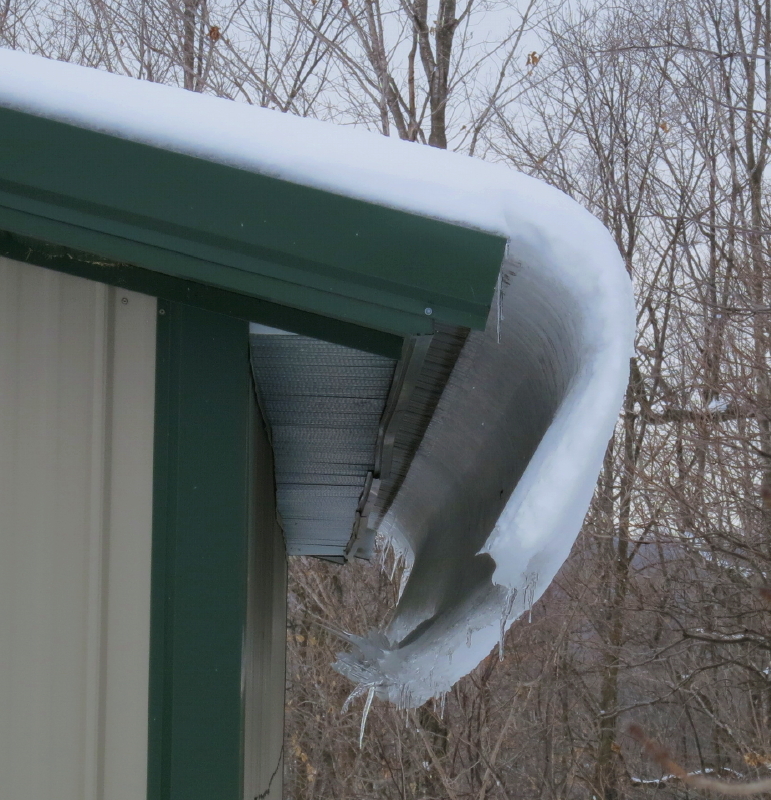 Melting snow, slowly making its way off the barn’s steel roof. 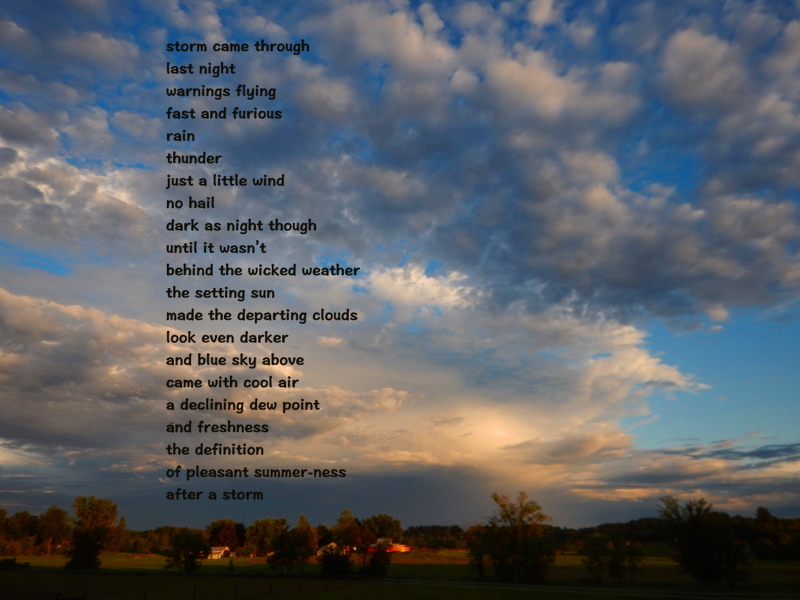 I’ve never had much luck interpreting what the weather was going to do next, but I have always had a keen interest in what’s happening in our skies. That is, I’m interested when the weather presents us with something dramatic, like storms, or record-setting extremes. I think meteorology is fascinating. As a result, and since I am lousy at predicting on my own, I make frequent use of weather web sites. As I write this, we are currently under a winter storm warning, and I have been checking the radar frequently. I started checking on Sunday. The storm was predicted to start in the early morning hours of Monday. When I was rudely awakened, several times, by the crashing and banging activity of raccoons on the deck in those wee hours of the a.m., I took advantage of the motion-light which had triggered, to find out the deck was still bone dry. That just added suspense to what daylight would reveal, at the break of dawn. Daylight revealed nothing. Still dry as could be. 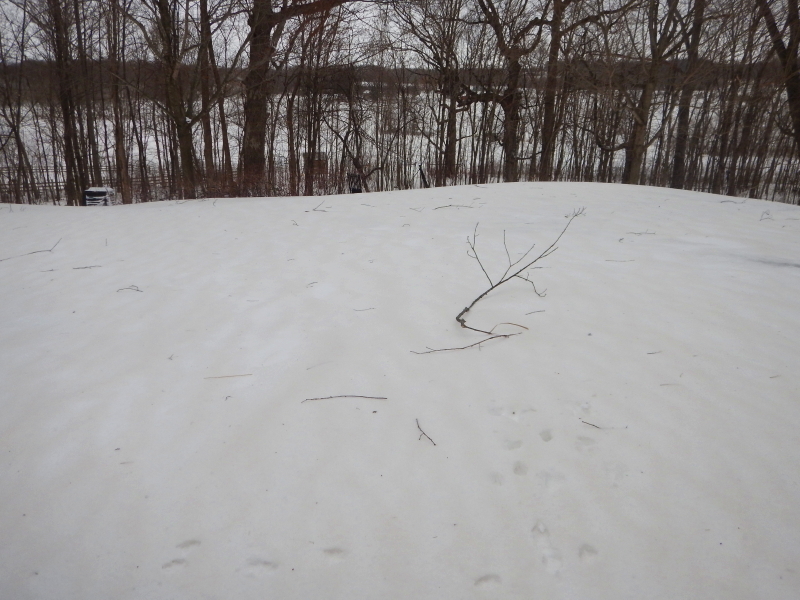 I checked with folks at work, on the other side of the Twin Cities, and learned they were getting accumulating snow. I immediately checked the radar, to see how far off it was, and what I found was pretty useless. The radar looked as if it was already on top of us and snow was falling over Beldenville. Maybe, but just not at my house. Or, maybe it was one of those situations where snow falling from the clouds was drying up before it could reach the ground. Whatever. 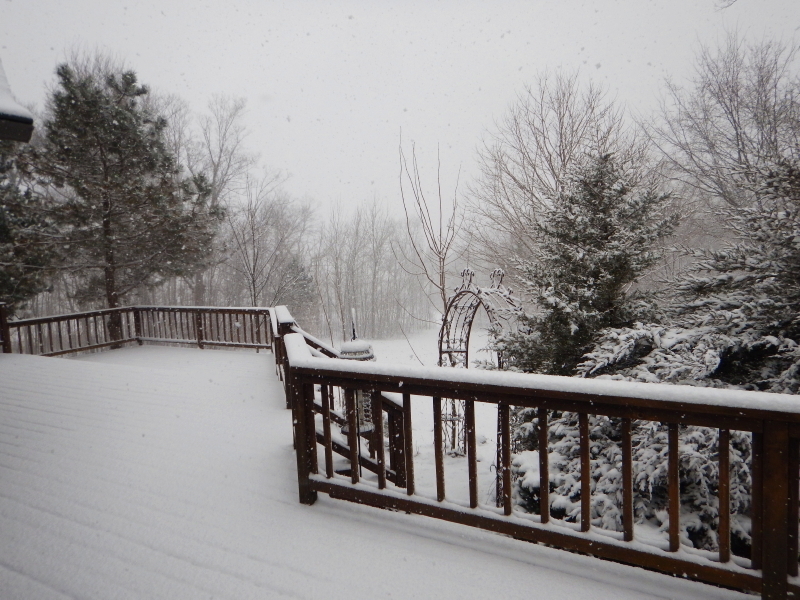 Finally, by 12:10 p.m. yesterday afternoon, I started to see some falling flakes. However, by 12:18 p.m., it had already stopped. 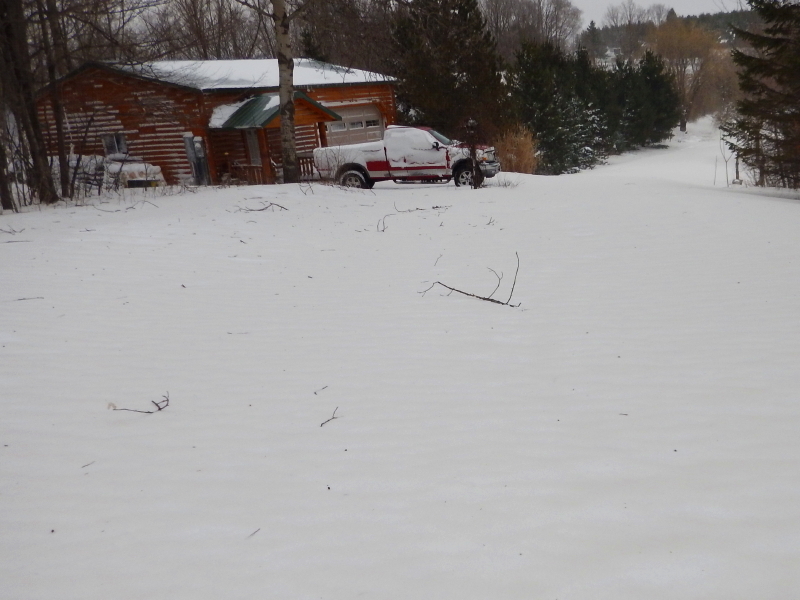 By the end of yesterday, all we had received was a trace of snow. What was going on? I checked Minnesota Public Radio’s Updraft weather blog. The post said they knew all along that the snow accumulation from this event would come in two waves, and the second wave would be the heavier amount. It also indicated that their computer model “insisted” that the area of greatest accumulation remained directly over the metro area, into western Wisconsin. The prediction for the timing of the heaviest snowfall was now the early morning hours of Tuesday. I made an advance decision to stay home from the day-job today, based on the warning of the ‘insisting’ computer model. I don’t dare hold ill feelings for the discrepancies between meteorologist’s predictions, and what really takes place. I certainly am not able to do any better. If all goes as planned (hoped), I will wake up (from a full night’s sleep), to find a massive accumulation of beautiful white snow, and then snuggle back under the covers to sleep in, giving the storm more time to move out of the area, toward the east. The afternoon will then be spent plowing and shoveling. That is, if the weather doesn’t deviate from what the computer model insists should happen.